AirTalk by OFF Line is an app designed to allow anyone with an iOS device within 100 meters of each other to communicate without an internet connection. This is a great idea if you’re away at a cottage or at a cabin in the woods where there’s no data connection to the outside world. It can also be a great tool if you’re at a downtown function and you want to meet up with other new and interesting people that might be using the app. It really is a great idea for an app, but unfortunately it doesn’t always meet expectations. AirTalk is a free app and it’s compatible with the iPhone, iPad, and iPod Touch. Communicating with other devices over Wi-Fi or Bluetooth with no actual internet connection is a great idea and AirTalk is not the only app designed to provide this capability, but there are surprisingly few of them. You would think this would create a great opportunity for an app like this but this one has a long way to go before it really takes advantage of this opening – at least in the North American market. It’s got a clean interface and a lot of potential, but to take advantage of the benefits of this app you will have to introduce it to your friends and family because it does not appear to have been widely adopted in North America just yet. A great thing about this app is that there are no ads or visual distractions to get in the way, which is great. Unfortunately though it falls short in other areas, specifically it’s complete lack of a decent set of instructions for using the app. There is a link to the apps official site from within the app, but this is extremely slow to load. When it does finally load it provides you with a general overview of the apps main features, but no step by step users guide for how to actually use the app. AirTalk app will require 11.5 MB of available space on your iOS device. 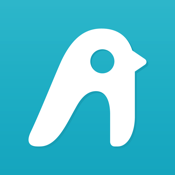 AirTalk app is designed to be more than just a personal communication tool between friends and family – it has many of the features that you’d typically expect to find in social networking apps and that is essentially what it is. The main difference being that this app is designed to still work whether you have an available internet connection or not. There’s a post section (feed) where you can view any posts from nearby users and you only have to tap on new post and type a quick message to add your voice to the conversation. You can also tap on the users button on the bottom menu if you want to see who’s nearby that you could potentially chat with. Anyone that’s using the app and is within 10 meters should be visible. While the app is advertised as a substitute for a social networking tool, it really works better as a communication tool between friends and family members that are in the same vicinity. If you live in a rural setting or a sparsely populated area this app doesn’t have the range to work as a useful social networking tool. If you live in a large city and a lot of people are using the AirTalk app it could work as a great way to meet new people, but it has a long way to go. AirTalk is a decent app if you’re looking for a communication tool that you can use with friends and family members when an internet connection is not available. It’s great for the cottage or a hike in the woods, but it doesn’t work quite as well as a social networking tool for meeting new people – at least not yet. If more users start to adopt this platform and it gains wide acceptance it definitely has a lot of potential.